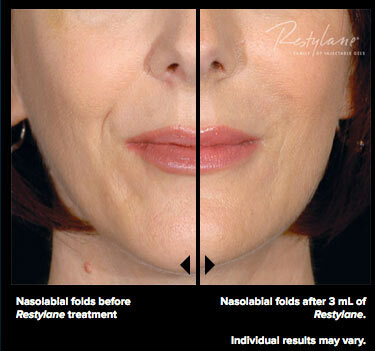 Restylane® is a comestic dermal filler that restores youthful contours to the skin to smooth away wrinkles. It is the most used and studied dermal filler on the market and has been used in over 70 countries! Restylane® or Perlane® are cosmetic dermal fillers that replace lost volume and restore youthful contours to the skin to smooth away moderate to severe facial wrinkles and folds, such as the lines from your nose to the corners of your mouth (nasolabial folds). Restylane is the world’s most used, most studied dermal filler, and has been used in over 70 countries and in more than 1.4 million treatments in the U.S. If you’re considering treatment for your facial wrinkles and folds, we invite you to learn important facts about Restylane® and Perlane®, including how they provide structural support and lift to nasolabial folds. In this section, you’ll learn where Restylane or Perlane can be used and see examples of how either treatment can help you reach your goal of a more youthful appearance. The procedure is non-surgical, and its effects are virtually instantaneous. Restylane and Perlane® are made of hyaluronic acid. In the human body, natural hyaluronic acid provides volume and fullness to the skin. The hyaluronic acid in Restylane and Perlane has been modified slightly to last longer than the body’s hyaluronic acid. The hyaluronic acid in Restylane and Perlane is produced by a biotechnical process. Restylane and Perlane are hydrophilic or “water loving.” The hydrophilic nature of these hyaluronic acid molecules and their three dimensional structure allows them to bind many times their own weight in water. As hyaluronic acid begins to degrade, each molecule binds to more water which helps to maintain its volume for about six months. The unique hyaluronic acid gel in Restylane® and Perlane® restores lost volume and fullness to the skin to correct the lines that run from your nose to the corners of your mouth (nasolabial folds). Perlane is composed of larger gel particles than Restylane and is intended for deeper injection to add volume for structural support and lift. In all cases, the procedure is non-surgical, and the results are virtually instantaneous. Sufficient volume of Restylane or Perlane should be injected depending on the severity of nasolabial folds to obtain optimal correction as determined by your physician. The availability of both products provides your physician with different treatment options. Your physician can best determine the optimal treatment amount. Restylane® and Perlane® require no pre-testing. Before being treated with Restylane and Perlane you should take a few precautions. Prior to treatment, avoid using aspirin, non-steroidal anti-inflammatory medications, St. John’s wort, or high doses of Vitamin E supplements. Also, if you have previously suffered from facial cold sores, discuss this with your doctor, who may prescribe a medication to minimize recurrence. Restylane® and Perlane® are approved for the treatment of moderate to severe facial wrinkles and folds, such as the lines from your nose to the corners of your mouth (nasolabial folds). Restylane® and Perlane® have well-defined safety profiles. Restylane has been used in over 1.4 million treatments in the U.S. and is available in more than 70 countries. It is the most studied cosmetic dermal filler in the world with dozens of publications in the medical literature. Clinical studies have shown no significant differences in the safety of Restylane and Perlane. Restylane and Perlane contain no animal proteins. This limits the risk of animal-based disease transmission or allergic reactions. Restylane and Perlane contain trace amounts of gram-positive bacterial proteins and are contraindicated for patients with a history of allergies to such material. No allergy testing is required before use. After your treatment with Restylane® or Perlane®, you may have some swelling, redness, pain, bruising, and tenderness. This will normally last less than seven days. • Visit the official Restylane Website. • View the BEFORE and AFTER Photo Gallery.